Microsoft Support. To create a new support request, in the Azure portal, on the Help tab, select the Help + support button, and then select New support request. I'm having an issue with Azure File Sync on my server (sync, cloud tiering, etc.). Should I remove and recreate my server endpoint? No: removing a server endpoint is not like rebooting a server! Removing and recreating the server endpoint is almost never an appropriate solution to fixing issues with sync, cloud tiering, or other aspects of Azure File Sync. Removing a server endpoint is a destructive operation, and may result in data loss in the case that tiered files exist outside of the server endpoint namespace (see Why do tiered files exist outside of the server endpoint namespace for more information) or in inaccessible files for tiered files existing within the server endpoint namespace. These issues will not resolve when the server endpoint is recreated. Tiered files may exist within your server endpoint namespace even if you never had cloud tiering enabled. We therefore recommend that you do not remove the server endpoint unless you would like to stop using Azure File Sync with this particular folder or have been explicitly instructed to do so by a Microsoft engineer. For more information on remove server endpoints, see Remove a server endpoint. Review installer.log to determine the cause of the installation failure. If you try to install the sync agent on an Active Directory domain controller where the PDC role owner is on a Windows Server 2008 R2 or below OS version, you may hit the issue where the sync agent will fail to install. To resolve, transfer the PDC role to another domain controller running Windows Server 2012 R2 or more recent, then install sync. Sign in to the server that you want to register. Open File Explorer, and then go to the Storage Sync Agent installation directory (the default location is C:\Program Files\Azure\StorageSyncAgent). Run ServerRegistration.exe, and complete the wizard to register the server with a Storage Sync Service. Server Registration displays the following message during Azure File Sync agent installation: "This server is already registered"
This message appears if the server was previously registered with a Storage Sync Service. 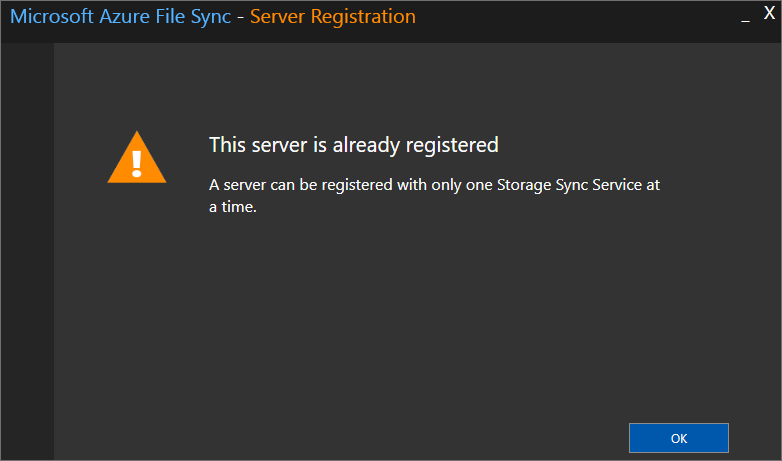 To unregister the server from the current Storage Sync Service and then register with a new Storage Sync Service, complete the steps that are described in Unregister a server with Azure File Sync. If the server is part of a cluster, you can use the optional Reset-StorageSyncServer -CleanClusterRegistration parameter to also remove the cluster registration. When I register a server, I see numerous "web site not trusted" responses. Why? This issue occurs when the Enhanced Internet Explorer Security policy is enabled during server registration. For more information about how to correctly disable the Enhanced Internet Explorer Security policy, see Prepare Windows Server to use with Azure File Sync and How to deploy Azure File Sync. Cloud endpoint creation fails, with this error: "The specified Azure FileShare is already in use by a different CloudEndpoint"
This issue occurs if the Azure file share is already in use by another cloud endpoint. Deleting the metadata on an Azure file share that is currently in use by a cloud endpoint causes Azure File Sync operations to fail. In the Azure portal, go to your Azure file share. Right-click the Azure file share, and then select Edit metadata. Right-click SyncService, and then select Delete. Cloud endpoint creation fails, with this error: "AuthorizationFailed"
This issue occurs if your user account doesn't have sufficient rights to create a cloud endpoint. In the Azure portal, select Resource groups. Select the resource group where the storage account is located, and then select Access control (IAM). Select the Role assignments tab. Select the Role (for example, Owner or Contributor) for your user account. In the Resource Provider list, select Microsoft Authorization. Role assignment should have Read and Write permissions. Role definition should have Read and Write permissions. This issue occurs if the server endpoint path is on the system volume and cloud tiering is enabled. Cloud tiering is not supported on the system volume. To create a server endpoint on the system volume, disable cloud tiering when creating the server endpoint. Server endpoint deletion fails, with this error: "MgmtServerJobExpired"
This issue occurs if the server is offline or doesn't have network connectivity. If the server is no longer available, unregister the server in the portal which will delete the server endpoints. To delete the server endpoints, follow the steps that are described in Unregister a server with Azure File Sync. This issue can occur if a management operation on the server endpoint fails. If the server endpoint properties page does not open in the Azure portal, updating server endpoint using PowerShell commands from the server may fix this issue. This issue can occur if the Storage Sync Monitor process is not running or the server is unable to communicate with the Azure File Sync service due to a proxy or firewall. Open Task Manager on the server and verify the Storage Sync Monitor (AzureStorageSyncMonitor.exe) process is running. If the process is not running, first try restarting the server. If restarting the server does not resolve the issue, upgrade to the latest Azure File Sync agent version. If the server is behind a firewall, verify port 443 outbound is allowed. If the firewall restricts traffic to specific domains, confirm the domains listed in the Firewall documentation are accessible. If the server is behind a proxy, configure the machine-wide or app-specific proxy settings by following the steps in the Proxy documentation. A server endpoint health status of "No Activity" means the server endpoint has not logged sync activity in the past two hours. Agent version 4.3.0.0 or older is installed and the server has an active VSS sync session (SnapshotSync). When a VSS sync session is active for a server endpoint, other server endpoints on the same volume cannot start a start sync session until the VSS sync session completes. To resolve this issue, install agent version 5.0.2.0 or newer which supports multiple server endpoints syncing on a volume when a VSS sync session is active. To check current sync activity on a server, see How do I monitor the progress of a current sync session?. The server has reached the maximum number of concurrent sync sessions. Agent version 4.x and newer: Limit varies based on available system resources. Agent version 3.x: 2 active sync sessions per processor or a maximum of 8 active sync sessions per server. If the server state on the registered servers blade is “Appears Offline,” perform the steps documented in the Server endpoint has a health status of “No Activity” or “Pending” and the server state on the registered servers blade is “Appears offline” section. If I created a file directly in my Azure file share over SMB or through the portal, how long does it take for the file to sync to servers in the sync group? Changes made to the Azure file share by using the Azure portal or SMB are not immediately detected and replicated like changes to the server endpoint. Azure Files does not yet have change notifications or journaling, so there's no way to automatically initiate a sync session when files are changed. On Windows Server, Azure File Sync uses Windows USN journaling to automatically initiate a sync session when files change. To detect changes to the Azure file share, Azure File Sync has a scheduled job called a change detection job. A change detection job enumerates every file in the file share, and then compares it to the sync version for that file. When the change detection job determines that files have changed, Azure File Sync initiates a sync session. The change detection job is initiated every 24 hours. Because the change detection job works by enumerating every file in the Azure file share, change detection takes longer in larger namespaces than in smaller namespaces. For large namespaces, it might take longer than once every 24 hours to determine which files have changed. Note, changes made to an Azure file share using REST does not update the SMB last modified time and will not be seen as a change by sync. We are exploring adding change detection for an Azure file share similar to USN for volumes on Windows Server. Help us prioritize this feature for future development by voting for it at Azure Files UserVoice. This issue is expected if you create a cloud endpoint and use an Azure file share that contains data. 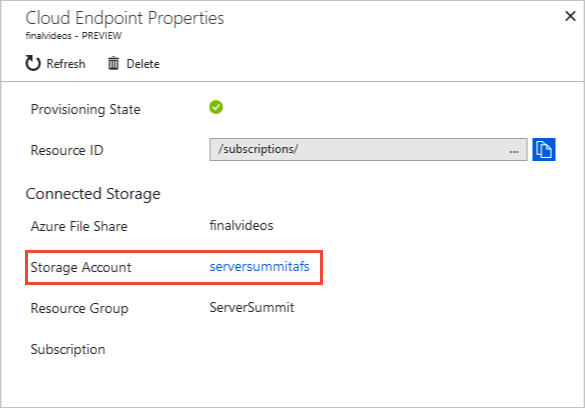 The change enumeration job that scans for changes in the Azure file share must complete before files can sync between the cloud and server endpoints. The time to complete the job is dependent on the size of the namespace in the Azure file share. The server endpoint health should update once the change enumeration job completes. How do I monitor sync health? Within each sync group, you can drill down into its individual server endpoints to see the status of the last completed sync sessions. A green Health column and a Files Not Syncing value of 0 indicate that sync is working as expected. If this is not the case, see below for a list of common sync errors and how to handle files that are not syncing. Go to the server's telemetry logs, which can be found in the Event Viewer at Applications and Services Logs\Microsoft\FileSync\Agent\Telemetry. Event 9102 corresponds to a completed sync session; for the latest status of sync, look for the most recent event with ID 9102. SyncDirection tells you if it this session was an upload or download. If the HResult is 0, then the sync session was successful. A non-zero HResult means that there was an error during sync; see below for a list of common errors. If the PerItemErrorCount is greater than 0, this means that some files or folders did not sync properly. It is possible to have an HResult of 0 but a PerItemErrorCount that is greater than 0. Below is an example of a successful upload. For the sake of brevity, only some of the values contained in each 9102 event are listed below. AppliedFileCount: 2, AppliedDirCount: 0, AppliedTombstoneCount 0, AppliedSizeBytes: 0. TransferredFiles: 2, TransferredBytes: 0, FailedToTransferFiles: 0, FailedToTransferBytes: 0. AppliedFileCount: 0, AppliedDirCount: 0, AppliedTombstoneCount 0, AppliedSizeBytes: 0. TransferredFiles: 0, TransferredBytes: 0, FailedToTransferFiles: 0, FailedToTransferBytes: 0. Sometimes sync sessions fail overall or have a non-zero PerItemErrorCount but still make forward progress, with some files syncing successfully. This can be seen in the Applied* fields (AppliedFileCount, AppliedDirCount, AppliedTombstoneCount, and AppliedSizeBytes), which tell you how much of the session is succeeding. If you see multiple sync sessions in a row that are failing but have an increasing Applied* count, then you should give sync time to try again before opening a support ticket. How do I monitor the progress of a current sync session? Within your sync group, go to the server endpoint in question and look at the Sync Activity section to see the count of files uploaded or downloaded in the current sync session. Note that this status will be delayed by about 5 minutes, and if your sync session is small enough to be completed within this period, it may not be reported in the portal. Look at the most recent 9302 event in the telemetry log on the server (in the Event Viewer, go to Applications and Services Logs\Microsoft\FileSync\Agent\Telemetry). This event indicates the state of the current sync session. TotalItemCount denotes how many files are to be synced, AppliedItemCount the number of files that have been synced so far, and PerItemErrorCount the number of files that are failing to sync (see below for how to deal with this). How do I know if my servers are in sync with each other? The timestamps for the Last Attempted Sync for both upload and download are recent. The status is green for both upload and download. The Sync Activity field shows very few or no files remaining to sync. The Files Not Syncing field is 0 for both upload and download. Look at the completed sync sessions, which are marked by 9102 events in the telemetry event log for each server (in the Event Viewer, go to Applications and Services Logs\Microsoft\FileSync\Agent\Telemetry). On any given server, you want to make sure the latest upload and download sessions completed successfully. To do this, check that the HResult and PerItemErrorCount are 0 for both upload and download (the SyncDirection field indicates if a given session is an upload or download session). Note that if you do not see a recently completed sync session, it is likely a sync session is currently in progress, which is to be expected if you just added or modified a large amount of data. When a server is fully up-to-date with the cloud and has no changes to sync in either direction, you will see empty sync sessions. These are indicated by upload and download events in which all the Sync* fields (SyncFileCount, SyncDirCount, SyncTombstoneCount, and SyncSizeBytes) are zero, meaning there was nothing to sync. Note that these empty sync sessions may not occur on high-churn servers as there is always something new to sync. If there is no sync activity, they should occur every 30 minutes. If all servers are up-to-date with the cloud, meaning their recent upload and download sessions are empty sync sessions, you can say with reasonable certainty that the system as a whole is in sync. Note that if you made changes directly in your Azure file share, Azure File Sync will not detect this change until change enumeration runs, which happens once every 24 hours. It is possible that a server will say it is up-to-date with the cloud when it is in fact missing recent changes made directly in the Azure file share. How do I see if there are specific files or folders that are not syncing? If your PerItemErrorCount on the server or Files Not Syncing count in the portal are greater than 0 for any given sync session, that means some items are failing to sync. Files and folders can have characteristics that prevent them from syncing. These characteristics can be persistent and require explicit action to resume sync, for example removing unsupported characters from the file or folder name. They can also be transient, meaning the file or folder will automatically resume sync; for example, files with open handles will automatically resume sync when the file is closed. When the Azure File Sync engine detects such a problem, an error log is produced that can be parsed to list the items currently not syncing properly. To see these errors, run the FileSyncErrorsReport.ps1 PowerShell script (located in the agent installation directory of the Azure File Sync agent) to identify files that failed to sync because of open handles, unsupported characters, or other issues. The ItemPath field tells you the location of the file in relation to the root sync directory. See the list of common sync errors below for remediation steps. 0x80c80207 -2134375929 ECS_E_SYNC_CONSTRAINT_CONFLICT A file or directory change can't be synced yet because a dependent folder is not yet synced. This item will sync after the dependent changes are synced. No action required. 0x7b 123 ERROR_INVALID_NAME The file or directory name is invalid. Rename the file or directory in question. See Handling unsupported characters for more information. 0x8007007b -2147024773 STIERR_INVALID_DEVICE_NAME The file or directory name is invalid. Rename the file or directory in question. See Handling unsupported characters for more information. 0x80c80018 -2134376424 ECS_E_SYNC_FILE_IN_USE A file cannot be synced because it's in use. The file will be synced when it's no longer in use. No action required. Azure File Sync creates a temporary VSS snapshot once a day on the server to sync files that have open handles. 0x80c8031d -2134375651 ECS_E_CONCURRENCY_CHECK_FAILED A file has changed, but the change has not yet been detected by sync. Sync will recover after this change is detected. No action required. 0x80c8603e -2134351810 ECS_E_AZURE_STORAGE_SHARE_SIZE_LIMIT_REACHED The file cannot be synced because the Azure file share limit is reached. To resolve this issue, see You reached the Azure file share storage limit section in the troubleshooting guide. 0x80070005 -2147024891 E_ACCESSDENIED This error can occur for the following reasons: file is encrypted by an unsupported solution (like NTFS EFS), file has a delete pending state or file is located on a DFS-R read-only replication folder If the file is encrypted by an unsupported solution, decrypt the file and use a supported encryption solution. For a list of support solutions, see Encryption solutions section in the planning guide. If the file is in a delete pending state, the file will be deleted once all open file handles are closed. If the file is located on a DFS-R read-only replication folder, Azure Files Sync does not support server endpoints on DFS-R read-only replication folders. See planning guide for more information. 0x20 32 ERROR_SHARING_VIOLATION A file cannot be synced because it's in use. The file will be synced when it's no longer in use. No action required. 0x80c80017 -2134376425 ECS_E_SYNC_OPLOCK_BROKEN A file was changed during sync, so it needs to be synced again. No action required. If the FileSyncErrorsReport.ps1 PowerShell script shows failures due to unsupported characters (error codes 0x7b and 0x8007007b), you should remove or rename the characters at fault from the respective file names. PowerShell will likely print these characters as question marks or empty rectangles since most of these characters have no standard visual encoding. The Evaluation Tool can be used to identify characters that are not supported. The table below contains all of the unicode characters Azure File Sync does not yet support. The sync session was canceled. Sync sessions may fail for various reasons including the server being restarted or updated, VSS snapshots, etc. Although this error looks like it requires follow-up, it is safe to ignore this error unless it persists over a period of several hours. A connection with the service could not be established. Verify the Windows service FileSyncSvc.exe is not blocked by your firewall. Verify that port 443 is open to outgoing connections to the Azure File Sync service. You can do this with the Test-NetConnection cmdlet. The URL for the <azure-file-sync-endpoint> placeholder below can found in the Azure File Sync proxy and firewall settings document. Ensure that the proxy configuration is set as anticipated. This can be done with the Get-StorageSyncProxyConfiguration cmdlet. 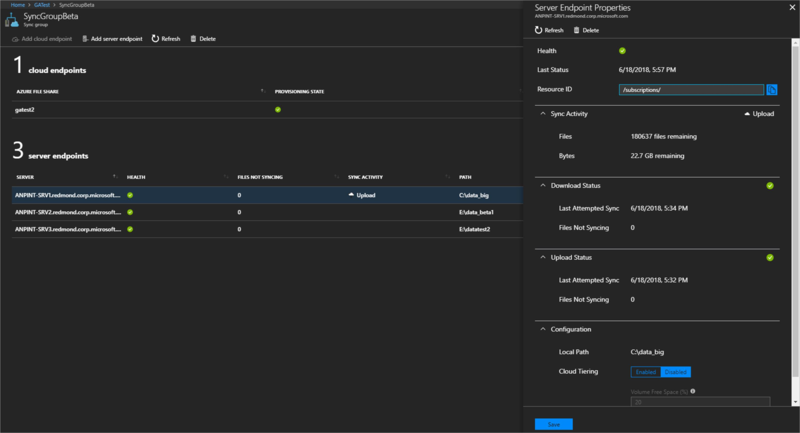 More information on configuring the proxy configuration for Azure File Sync can be found in the Azure File Sync proxy and firewall settings. Contact your network administrator for additional assistance troubleshooting network connectivity. The user request was throttled by the service. No action is required; the server will try again. If this error persists for longer than a couple hours, create a support request. Sync can't access the Azure file share specified in the cloud endpoint. Verify the storage account exists. Check to make sure the storage account does not contain any network rules. Ensure the Azure file share exists. Ensure Azure File Sync has access to the storage account. The storage account name used could not be resolved. Check that you can resolve the storage DNS name from the server. Sync failed due to a problem with the sync database. This error occurs when there is a problem with the internal database used by Azure File Sync. When this issue occurs, create a support request and we will contact you to help you resolve this issue. The Azure File Sync agent version installed on the server is not supported. This error occurs if the Azure File Sync agent version installed on the server is not supported. To resolve this issue, upgrade to a supported agent version. You reached the Azure file share storage limit. This error occurs when the Azure file share storage limit has been reached, which can happen if a quota is applied for an Azure file share or if the usage exceeds the limits for an Azure file share. For more information, see the current limits for an Azure file share. Navigate to the sync group within the Storage Sync Service. Select the cloud endpoint within the sync group. Note the Azure file share name in the opened pane. Select the linked storage account. If this link fails, the referenced storage account has been removed. Select Files to view the list of file shares. Click the three dots at the end of the row for the Azure file share referenced by the cloud endpoint. Verify that the Usage is below the Quota. Note unless an alternate quota has been specified, the quota will match the maximum size of the Azure file share. If the share is full and a quota is not set, one possible way of fixing this issue is to make each subfolder of the current server endpoint into its own server endpoint in their own separate sync groups. This way each subfolder will sync to individual Azure file shares. The Azure file share cannot be found. If the Azure file share was deleted, you need to create a new file share and then recreate the sync group. Sync is paused while this Azure subscription is suspended. This error occurs when the Azure subscription is suspended. Sync will be reenabled when the Azure subscription is restored. See Why is my Azure subscription disabled and how do I reactivate it? for more information. The storage account has a firewall or virtual networks configured. Remove these rules to fix this issue. A high number of file changes across the servers in the sync group. A large number of errors on individual files and directories. If this error persists for longer than a few hours, create a support request and we will contact you to help you resolve this issue. The server failed to establish a secure connection. The cloud service received an unexpected certificate. This error can happen if your organization is using an SSL terminating proxy or if a malicious entity is intercepting the traffic between your server and the Azure File Sync service. If you are certain that this is expected (because your organization is using an SSL terminating proxy), you skip certificate verification with a registry override. Create the SkipVerifyingPinnedRootCertificate registry value. Restart the sync service on the registered server. By setting this registry value, the Azure File Sync agent will accept any locally trusted SSL certificate when transferring data between the server and the cloud service. Sync failed due to a problem with authentication. Open the Certificates MMC snap-in, select Computer Account and navigate to Certificates (Local Computer)\Personal\Certificates. Check if the client authentication certificate is expired. Verify Azure File Sync agent version 4.0.1.0 or later is installed. The volume where the server endpoint is located is low on disk space. This error occurs because the volume has filled up. This error commonly occurs because files outside the server endpoint are using up space on the volume. Free up space on the volume by adding additional server endpoints, moving files to a different volume, or increasing the size of the volume the server endpoint is on. The service is not yet ready to sync with this server endpoint. This error occurs because there are changes on the Azure file share directly and change detection is in progress. Sync will commence when change detection completes. Sync failed due to problems with many individual files. In cases where there are many per file sync errors, sync sessions may begin to fail. Azure File Sync creates a temporary VSS snapshot once a day on the server to sync files that have open handles. Sync failed due to a problem with the server endpoint path. Ensure the path exists, is on a local NTFS volume, and is not a reparse point or existing server endpoint. This error occurs because the Cloud Tiering filter driver (StorageSync.sys) version loaded is not compatible with the Storage Sync Agent (FileSyncSvc) service. If the Azure File Sync agent was upgraded, restart the server to complete the installation. If the error continues to occur, uninstall the agent, restart the server and reinstall the Azure File Sync agent. This error occurs because the Azure File Sync service is unavailable. This error will auto-resolve when the Azure File Sync service because available again. Sync failed due to a transient problem with the sync database. This error occurs because of an internal problem with the sync database. This error will auto-resolve when the Azure File Sync when sync retries. If this error continues for an extend period of time, create a support request and we will contact you to help you resolve this issue. # in a reference variable. Write-Host "The storage account referenced in the cloud endpoint does not exist." Once in the storage account, select Firewalls and virtual networks on the left-hand side of the storage account. Inside the storage account, the Allow access from all networks radio button should be selected. Click Overview on the left-hand table of contents to return to the main storage account page. Verify the file share referenced by the cloud endpoint appears in the list of file shares (you should have noted this in step 1 above). Write-Host "The Azure file share referenced by the cloud endpoint does not exist"
Click Access control (IAM) on the left-hand table of contents. Click the Role assignments tab to the list the users and applications (service principals) that have access to your storage account. Verify Hybrid File Sync Service appears in the list with the Reader and Data Access role. In the Role field, select Reader and Data Access. In the Select field, type Hybrid File Sync Service, select the role and click Save. How do I prevent users from creating files containing unsupported characters on the server? You can use File Server Resource Manager (FSRM) File Screens to block files with unsupported characters in their names from being created on the server. You may have to do this using PowerShell as most of the unsupported characters are not printable and so you need to cast their hexadecimal representations as characters first. First create an FSRM File Group using the New-FsrmFileGroup cmdlet. This example defines the group to contain only two of the unsupported characters, but you can include as many of the characters as necessary in your file group. Once you have defined an FSRM File Group, you can create an FSRM File Screen using the New-FsrmFileScreen cmdlet. New-FsrmFileScreen -Path "E:\AFSdataset" -Description "Filter unsupported characters" -IncludeGroup "Unsupported characters"
Note that file screens should only be used to block the creation of characters not supported by Azure File Sync. If file screens are used in other scenarios, sync will continually try to download the files from the Azure file share to the server and will be blocked due to the file screen, resulting in high data egress. Files can fail to tier, which means that Azure File Sync unsuccessfully attempts to tier a file to Azure Files. Files can fail to recall, which means that the Azure File Sync file system filter (StorageSync.sys) fails to download data when a user attempts to access a file which has been tiered. Transient storage service availability issues. For more information, see the Service Level Agreement (SLA) for Azure Storage. Inaccessible Azure file share. This failure typically happens when you delete the Azure file share when it is still a cloud endpoint in a sync group. Inaccessible storage account. This failure typically happens when you delete the storage account while it still has an Azure file share which is a cloud endpoint in a sync group. Azure File Sync file system filter (StorageSync.sys) is not loaded. In order to respond to tiering/recall requests, the Azure File Sync file system filter must be loaded. The filter not being loaded can happen for several reasons, but the most common reason is that an administrator unloaded it manually. The Azure File Sync file system filter must be loaded at all times for Azure File Sync to properly function. 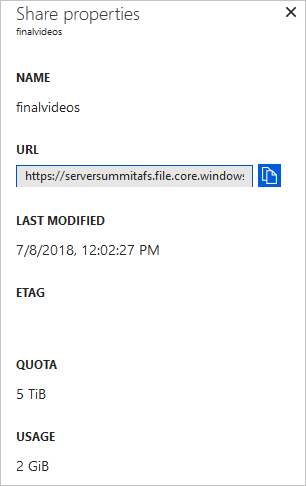 A reparse tag, which indicates to the operating system that the Azure File Sync file system filter (StorageSync.sys) may need to do some action on IO to the file. Reparse data, which indicates to the file system filter the URI of the file on the associated cloud endpoint (the Azure file share). The most common way a reparse point could become corrupted is if an administrator attempts to modify either the tag or its data. Network connectivity issues. In order to tier or recall a file, the server must have internet connectivity. The following sections indicate how to troubleshoot cloud tiering issues and determine if an issue is a cloud storage issue or a server issue. To monitor tiering activity on a server, use Event ID 9003, 9016 and 9029 in the Telemetry event log (located under Applications and Services\Microsoft\FileSync\Agent in Event Viewer). Event ID 9003 provides error distribution for a server endpoint. For example, Total Error Count, ErrorCode, etc. Note, one event is logged per error code. Event ID 9016 provides ghosting results for a volume. For example, Free space percent is, Number of files ghosted in session, Number of files failed to ghost, etc. Event ID 9029 provides ghosting session information for a server endpoint. For example, Number of files attempted in the session, Number of files tiered in the session, Number of files already tiered, etc. To monitor recall activity on a server, use Event ID 9005, 9006, 9009 and 9059 in the Telemetry event log (located under Applications and Services\Microsoft\FileSync\Agent in Event Viewer). Event ID 9005 provides recall reliability for a server endpoint. For example, Total unique files accessed, Total unique files with failed access, etc. Event ID 9006 provides recall error distribution for a server endpoint. For example, Total Failed Requests, ErrorCode, etc. Note, one event is logged per error code. Event ID 9009 provides recall session information for a server endpoint. For example, DurationSeconds, CountFilesRecallSucceeded, CountFilesRecallFailed, etc. Event ID 9059 provides application recall distribution for a server endpoint. For example, ShareId, Application Name, and TotalEgressNetworkBytes. In Event Viewer, review the telemetry, operational and diagnostic event logs, located under Applications and Services\Microsoft\FileSync\Agent. Verify the files exist in the Azure file share. A file must be synced to an Azure file share before it can be tiered. Verify the server has internet connectivity. At an elevated command prompt, run fltmc. Verify that the StorageSync.sys and StorageSyncGuard.sys file system filter drivers are listed. An Event ID 9003 is logged once an hour in the Telemetry event log if a file fails to tier (one event is logged per error code). The Operational and Diagnostic event logs should be used if additional information is needed to diagnose an issue. Open the Services MMC snap-in and verify the Storage Sync Agent service (FileSyncSvc) is running. An Event ID 9006 is logged once per hour in the Telemetry event log if a file fails to recall (one event is logged per error code). The Operational and Diagnostic event logs should be used if additional information is needed to diagnose an issue. Antivirus, backup, and other applications that read large numbers of files cause unintended recalls unless they respect the skip offline attribute and skip reading the content of those files. Skipping offline files for products that support this option helps avoid unintended recalls during operations like antivirus scans or backup jobs. Consult with your software vendor to learn how to configure their solution to skip reading offline files. Unintended recalls also might occur in other scenarios, like when you are browsing files in File Explorer. Opening a folder that has cloud-tiered files in File Explorer on the server might result in unintended recalls. This is even more likely if an antivirus solution is enabled on the server. Use Event ID 9059 in the Telemetry event log to determine which application(s) is causing recalls. This event provides application recall distribution for a server endpoint and is logged once an hour. In Event Viewer, review the telemetry, operational and diagnostic event logs. Sync, tiering, and recall issues are logged in the telemetry, diagnostic and operational event logs under Applications and Services\Microsoft\FileSync\Agent. Issues related to managing a server (for example, configuration settings) are logged in the operational and diagnostic event logs under Applications and Services\Microsoft\FileSync\Management. Open the Services MMC snap-in and verify that the Storage Sync Agent service (FileSyncSvc) is running. Create a directory where the AFSDiag output will be saved (for example, C:\Output). Debug-Afs c:\output # Note: Use the path created in step 1. For the Azure File Sync kernel mode trace level, enter 1 (unless otherwise specified, to create more verbose traces), and then press Enter. For the Azure File Sync user mode trace level, enter 1 (unless otherwise specified, to create more verbose traces), and then press Enter. Reproduce the issue. When you're finished, enter D.
A .zip file that contains logs and trace files is saved to the output directory that you specified.